"Haavisto has provided a comprehensive and well researched tool to help patients, physicians and other health care practitioners understand more about CFS/ME and how to treat it effectively. It is a must read for health care providers." --Kathy Quan, RN BSN PHN, author of "The Everything New Nurse Book" and "The Everything Guide to Careers in Health Care"
How to get better? Maija Haavisto's unique CFS/ME/FM treatment book will answer that question. The most comprehensive guide published on the subject, it features over 250 medications (with over 1,000 references) that can be used to treat chronic fatigue syndrome/myalgic encephalomyelitis, fibromyalgia and related conditions, such as Gulf War syndrome (GWS), NMH, POTS and other dysautonomias, multiple chemical sensitivity (MCS), myofascial pain syndrome (MPS), restless legs syndrome (RLS), irritable bowel syndrome (IBS), headaches and chronic pain in general. It will help both you and your doctor to understand your illness better and to make more informed treatment choices. For more information (including ordering information) see the Book section. If you have any questions, see if they have already been answered in the FAQ. Journalists should visit the Press section. No matter how sick you are, you can get better. It is all about being informed. Get the ball rolling now! You can buy the book from e.g. Amazon. I apologize for the lack of updates in the recent years. In November 2011 my pituitary was destroyed, a CFS/ME complication exacerbated by severe acute stress intentionally caused by other people. I am now finally getting treatment for all my hormone deficiencies (not just most of them), so hopefully in due course I will be as good as new. In the meanwhile I have had three new books published in Finland: another medical textbook about treatment of autoimmune diseases, and two new novels (after my debut), of which one is about CFS/ME. And in March my debut play Marian ilmestykset, based on my debut novel, premiered in Finland. I believe the first CFS/ME-themed play in the world? A video recording with English subtitles remains a possibility. The CFS/ME articles I wrote for the Suite101 magazine, which were linked on the Articles page, are no longer available online. I am hoping to relocate most or all of them under this site and/or my personal website in the coming months. 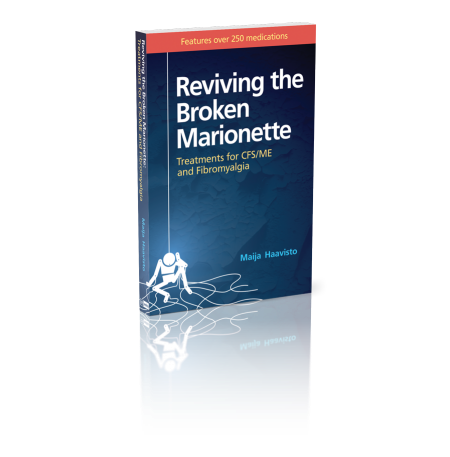 Reviving the Broken Marionette: Treatments for CFS/ME and Fibromyalgia, is of course still available and still getting rave reviews. Some new Updates to the book and Reviews have been added. The traditional holiday contest is here again, open until the 22nd of December. This year, besides electronic copies of the book, you can also win a print copy! Content by Maija Haavisto. Last modified: 16th May 2014.